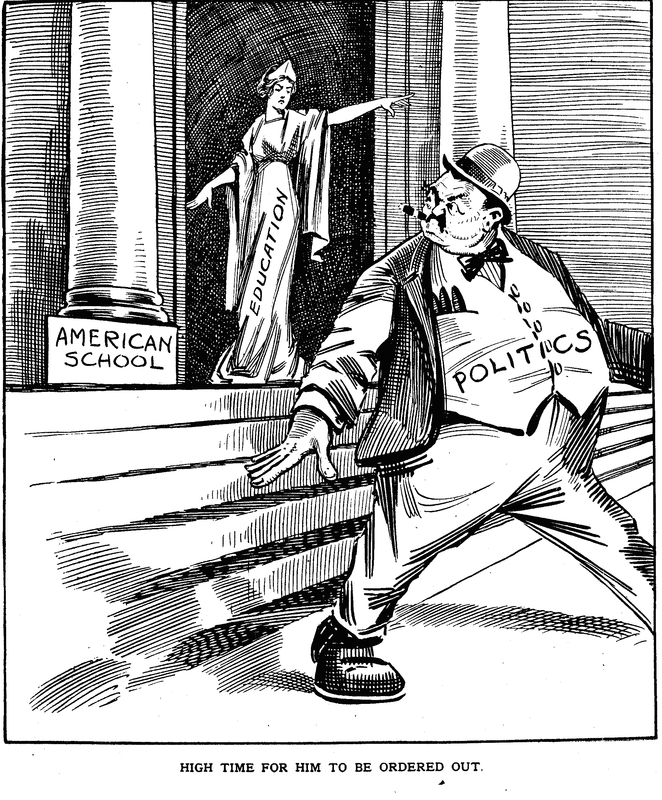 From the American School Board Journal, circa 1900. Secretary of Education Arne Duncan has announced a new crusade to bring mayoral politics to all big city school districts. He said mayoral control provides more accountability, stability and flexibility to implement reform. Duncan — citing improved test scores and graduation rates, more school choice and curbing social promotion. Currently only seven of the largest districts are under some form of mayoral control. Not a very big sample size. Mayoral was tried and abandoned in Detroit and Washington in the recent past and in the distant past it was common. Never play poker with anyone who lived or worked in Mayor Richard M. Daley’s Chicago — as Duncan did — and can keep a straight face while discussing “mayoral accountability.” The “Mayor for Life” is accountable to no one. Yes, that gives him more stability and flexibility. The appeals to accountability and stability are contradictory. In other cities, the mayor may not enjoy Richie Daley’s infinite tenure. In those places, educational accountability may function but stability goes out the window. Educational accountability is also present in Board of Education elections and Superintendent contracts and in these cases it is the sole issue; with mayors people vote based on everything from patronage jobs to garbage pick-up. The record on test-scores and graduation rates is limited and mixed. Social promotion, I have no idea. That leaves “school choice.” Yes, the mayoral educational Czars have liked their charter schools, as does our misguided President and his Secretary Duncan. I have trouble believing that the core of this is about charter schools, but I may be wrong. That’s one reason to favor keeping elected Boards in charge. Inefficiency is part of democracy. Harvard Educational Review, Summer 2006, Special Issue on Mayoral Leadership in Education. Kenneth K. Wong, Francis X. Shen, Dorothea Anagnostopoulos, Stacey Rutledge, The Education Mayor: Improving America’s Schools.